The market has produced a dizzying array of mobile digital devices – smartphones, tablets, wearables and more. As new technologies become available at a breakneck pace and adoption skyrockets, how can marketers keep up? 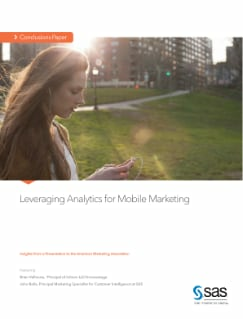 This paper describes how analytics helps marketers take advantage of mobile technologies to develop better relationships with their customers and deliver greater value.